The International Commission on Benedictine Education (ICBE), a group of educators from Benedictine and Cistercians schools, met at the end of October (2013) in Manila. More than 150 educators assembled at the global conference (BeNET=Benedictine Educators Network). One of the tasks of the Abbot Primate at the Manila meeting, Notker Wolf, OSB, was to appoint a new ICBE president to replace Father Christopher Jamieson, OSB, the founding president. Jamison served the ICBE for the last 10 years and he is a monk and former abbot of Worth Abbey, England. Abbot Notker elected Father Elias Lorenzo, OSB, a monk of Saint Mary’s Abbey (Morristown, NJ) and current prior at Sant’Anselmo (Rome); Father Elias is a co-founder of the ICBE, and experienced educator, administrator and insightful preacher. The ICBE is an organization which works to gather educators from monastery schools who follow the Rule of Saint Benedict. According to the tradition of the Church, monasteries are independent entities and often have no network of collaboration, unlike the Salesians and the Jesuits who have international associations. These other religious orders are governed by a central body with regional provinces. They naturally have a built-in network that Benedictines and Cistercians do not have available. Hence, there has been a perceived need to assist Benedictine and Cistercian faculties in matters pertaining to a formation in the cultures of the intellect, spiritual, human, communal and work. The controlling idea is that the education is effective and fully catholic (think of the 4 marks of the Church) when not only information is shared, but real, concrete experience is shared shared. The formative process is done in the community. The ICBE is interested in wisdom, not merely knowledge. 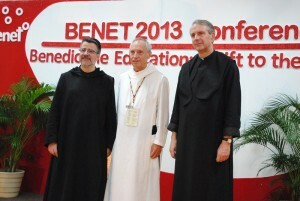 The ICBE and the BeNET have been instrumental in advancing the formation of the laity who teach in schools where the numbers of Benedictines and Cistercians are on the decrease. But even in monastery schools with a sufficient number of monks and nuns there is a need for appropriate formation as an educator in the key of Jesus Christ through the lens and culture of Saint Benedict and Saint Scholastica, and the patrimony. The next international meeting of the ICBE will be in Rome in 2016. Pope Francis to nuns: is this lamp still alight in convents? As mentioned yesterday, Pope Francis went to the monastery of Saint Anthony the Abbot, the home of the Camaldolese Benedictine nuns on the Aventine (Rome). There he was welcomed by Sister Michela Porcellato, the religious superior of 21 nuns. The occasion of his presence among these contemplative nuns was to honor the Day for Contemplative Life (instituted in 1953 by Pope Pius XII as the Pro Orantibus Day); it also was one to the marks of the end of the Year of Faith. We contemplate Her who knew and loved Jesus as no other creature. The Gospel we heard shows the fundamental attitude with which Mary expressed her love for Jesus: to do the will of God. “Whoever does the will of my Father in Heaven is my brother, and sister, and mother” (Matthew 12:50). With these words, Jesus leaves an important message: the will of God is the supreme law that establishes true belonging to Him. Therefore, Mary established a bond of kinship with Jesus even before giving him birth: she became a disciple and Mother of her Son the moment she received the words of the Angel and said: “Behold, I am the handmaid of the Lord; let it be to me according to your word” (Luke 1:38). This “let it be” is not only acceptance, but also trustful openness to the future. This “let it be” is hope! Yet, in face of all these difficulties and surprises of God’s plan, the Virgin’s hope never hesitates! Woman of hope. This tells us that hope is nourished by listening, by contemplation, by patience, so that the times of the Lord will mature. Also at the Wedding of Cana, Mary is the Mother of hope, which makes her attentive and solicitous to human things. With the beginning of his public life, Jesus becomes the Teacher and the Messiah: Our Lady looks at her Son’s mission with exultation but also with apprehension, because Jesus becomes increasingly the sign of contradiction that the elderly Simeon had pre-announced to her. At the foot of the cross, she is the woman of sorrow and at the same time of vigilant waiting of a mystery, greater than the sorrow, which is about to take place. Everything seems truly finished; every hope it could be said was spent. At that moment, recalling the promises of the Annunciation, she also could have said: they have not come true, I was deceived. But she did not say it. Yet she, blessed because she believed, sees blossom from her faith the new future and waits with hope for God’s tomorrow. Sometimes I wonder: are we able to wait for God’s tomorrow? Or do we want it today? For her God’s tomorrow is the dawn of the Easter morning, of that first day of the week. It would do us good to contemplate the Son’s embrace with the Mother. The only lighted lamp at the entrance of Jesus’ sepulcher is his Mother’s hope, which at that moment is the hope of the whole of humanity. I ask myself and you: is this lamp still alight in convents? Is God’s tomorrow still awaited in convents? We owe much to this Mother! In her, present in every moment of the history of salvation, we see a solid witness of hope. She, Mother of hope, supports us in moments of darkness, of difficulty, of distress, of apparent defeat or of real human defeats. May Mary, our hope, help us to make of our life a pleasing offering to the Heavenly Father, and a joyful gift for our brothers, an attitude that always looks to tomorrow. When Pope Francis went to the Sant’Antonio Abate Monastery for Vespers today, he made an unusual visit to the monastic cell of an American Mystic and anchoress. 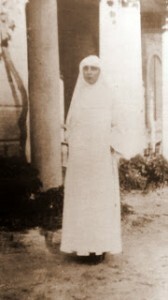 Sister Nazarena. The Camaldolese Benedictine nun is not well known; Sister Nazarena of Jesus, was known in history as Julia Crotta (October 15, 1907 – February 7, 1990). She made the honest claim that her vocation was the direct result of a vision she had of the Lord. She reports that the Lord called her name, “Julia, come to me in the desert, I will never leave you.” She would come to devote her life in love through music, according to the grace God gave her. A Jesuit sent her to Rome to find her vocation. Monastery is located at the foot of the Aventine Hill, not far from Byzantine Church of Santa Maria in Cosmedin (one of my favorite churches in Rome) and not far from the Church of Santa Sabina and Sant’Anselmo –the Benedictine house of studies. Crotta was from Glastonbury, Connecticut, a daughter of Italian immigrants, a gifted and trained musician who began her studies at Hartford Consevatory, then at the Yale School of Music in violin and composition, but left Yale to finish at Albertus Magnus College up the street run by the Dominican Sisters of St Mary’s of the Springs (now Dominican Sisters of Peace). She finished with a degree in French. She taught music in Manhattan before trying her vocation with the Carmelites in two different monasteries. After meeting with Pope Pius XII, Julia Crotta became a Camaldolese Benedictine nun and later an anchoress, that is, living a hidden life for 45 years. Her name in religion was Sister Nazarena of Jesus. The Camaldolese’s founder was an anchorite, Saint Romuald (who live around the AD 1000), and they honored the recluse vocation. Hers was a rare vocation yet a shining star in the Church. Pope Paul VI visited Sister Nazarena in 1966. The quick link to the interview is here with Vatican Radio. Father Thomas is a monk of New Camaldoli Hermitage in Big Sur, California and an adjunct professor of Theology at Jesuit School of Theology at Santa Clara. Here is an example of holiness springing up from Connecticut!!! As one of the final events for the Year of Faith Pope Francis will have a “Pro Orantibus Day,” honoring the liturgical feast of of the Presentation of the Blessed Virgin Mary. Since 1953, today has been a day of prayer for those belonging to contemplative religious orders. Pope Pius XII established this day to remind all the faithful of the indispensability of contemplative vocation for the health of the Church. It is also a day many of the Benedictine Oblates renew their oblation to their monastery. At Vespers, the Pope Francis will visit a Camaldolese monastery of cloistered nuns, Sant’Antonio abate, on the Aventine hill. Previous Roman Pontiffs have prayed at this monastery. Here’s a VERY fascinating interview with Veronica Scarisbrick of Vatican Radio with one of the nuns (the radio link) at Sant’Antonio. Listen to the interview, please. AND there’s another report here from Vatican Radio. Rome Reports has a report here. The meeting of Pope Francis with Metropolitan Hilarion –the not first– ran concurrent today with Cardinal Angelo Scola of Milan meeting in Moscow with Patriarch Kirill, leader of the Russian Orthodox Church. Francis like Benedict, and with Hilarion and Kirill there is a substantial commitment to good fraternal relations with various members of the Orthodox Church which is really fantastic. Vatican Radio’s Philippa Hitchen spoke with one of the editors of the journal, Irenikon, Benedictine Father Thaddeus Barnas of Chevetogne Abbey, whose founding by the famed Dom Lambert Beauduin following the 1924 encourage of Pope Pius XI which focussed on the Orthodox spirituality and promoting reconciliation between Catholics and Orthodox. The Benedictines monks seek the face of God, and they work for ecumenical connections from the standpoint of prayer, study and fraternal relations. Listen to the interview with Father Thaddeus.